There are names that you hear growing up while studying journalism, reagrdless of the specific area or field of journalism you decide to station yourself in. In entertainment journalism, although hardly ever really dangerous (with the exception of some volatile celebrities), the truth matters almost as much as our opinion, after all, film is art; and art is as objective as, well, perhaps the most objective thing in the world. Yet, studying journalism in any field, its hard not to come across the name of Marie Colvin, one of, if not the most celebrated war correspondent in the world. A Private War is less an autobiography about an exceptional human being and a real fearless woman, and more of an account of a decade of absolute fear, anger, war, terror and true, nonfictional horror. The film follows Colvin from 2001 to 2012, following her journey from Sri Lanka, Iraq, Iran, Chechnya, Kosovo, Libya, East Timor and fatefully, Syria. While the story is basically set in warn torn countries, showcasing Colvin being shot at, exploded next to, or her constantly dodging or covering herself with her hands, the setting of war somehow doesn’t become desensitized to the audience. Instead, the setting of war becomes this harrowingly afflicted journey of truth and understanding as to why this motherless, companionless woman still willingly decided to venture into the most dangerous parts of the world, for a story. Yet, it becomes clear that the story is far from Colvin’s objective as a journalist. Instead, Colvin was interested in one thing and one thing only, and no, its not the truth as the trailer so confidently suggests. Colvin’s obsession was always about the individual stories of people who were given first row tickets to seeing the terrorizing events taking place in and around their homes and right in their backyards, literally; their experiences. Whether it be wailing mothers mourning the deaths of their husbands, children, sisters or brothers, or men sharing their lose to Colvin, or children bleeding next to her on dried blood-soaked hospital beds, Colvin learns the truth of so many of the vicious dictators and government officials through the truths of civilians, contrasting them next to the lies of these ‘civilized’ officials of government and members of parliament. 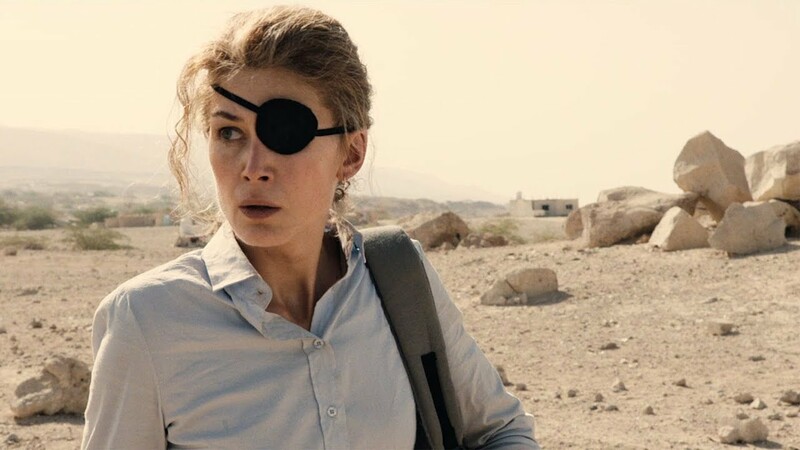 A Private War has many contributing factors that make it a success, beginning with the strong and commanding performance by Rosamund Pike. Although I’ve never seen interviews of Colvin before watching this film and only have read about her and her stories in the past, watching YouTube videos of her and comparing her mannerism and voice to that of Pike’s is almost uncannily scary. Pike takes her raspy, smoked voice, and fills each line, scene and war with the same level of intoxicating force similar to Colvin’s approach to alcohol. While the film makes its own assumptions of Colvin’s private and personal life, including her escapades as a sexual savant, one fo the aspects of the film that I truly wished had more time was the focus and concern for Colvin’s quite apparent post traumatic stress disorder. Again, director Matthew Heinman as well as screenwriter Arash Amel collectively decided to not make the film about Colvin’s life, trials and tribulations, but more man account of the inhumanity she catapulted herself in willingly. Yet little remarks here and there about Colvin’s overall sanity and health, especially by her longtime collaborator and friend Paul Conroy (Jamie Dornan) claiming that ‘she has seen more war than some soldiers’, is a small yet unsatisfactory decent into the questioning concerns of Colvin’s well being. Aside from Pike, Dornan gives a capturing performance as Conroy, elevating his acting chops and expectations, despite his renown turn as Christian Grey in the Fifty Shades series. In addition to Dornan, Tom Hollander gives a magnificent moral or immoral turn as Colvin’s editor Sean Ryan, a man who, as Colvin’s longtime friend and professional advisor, pushes her to pursue these stories, despite the inherit danger he willingly knows he puts her in, year after year. Their final confrontation is awards caliber stuff, reminiscent of colleges bickering in Boyle’s Steve Jobs film between Michael Fassbender and Jeff Daniels, a performance that gained Daniels and Fassbender acting nominations in their respective categories. While A Private War will be hard-pressed to gain any Academy Award nominations this season, not because of the film itself or the content, but more-so due to its very heavy handed realities as well as factual depiction of war, governments and the negligence of international aid, the film may be a little too gritty and bleak for any nominations at all. The perils of war, the dangers of journalism and the humanistic touch of Colvin’s journalistic work ethic may be something the Academy choose to overlook, despite the the war correspondent herself being killed while covering the Syrian government’s 2012 siege in Homs. And no, this is not a plot point twist or spoiler; Colvin’s life is a notable one and the story and courage of her coverage is one that should be explored greater and in a wider capacity, despite her tragic fate. 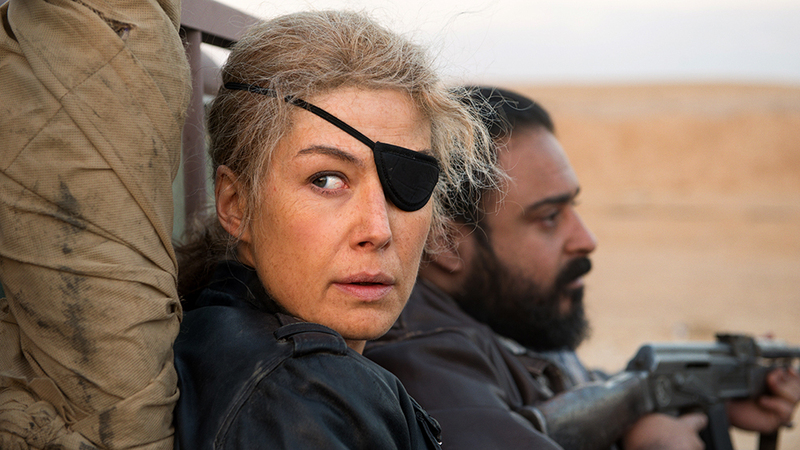 A Private War evolves with each and every passing scene through its very substantial runtime. The evolution of a cynical and perhaps suicidal journalist glimmers through two hours of filmmaking that is intent of showing the true calamities of war, and none of the glamour of its rage. Pike excels as Colvin, in an awards worthy performance. Whether she be crouched over avoiding death at every turn, sipping down copious amounts of bourbon, or bedding her next victim to mask all the fear encapsulating each moment of her world, Pike gives us chills as a war correspondent who writes about people and not about bombs, explosions or violent spectacle, and wears designer caliber bras. Suffering, death, pain, anger, fear, is the story Colvin writes about, but hope, intellect and knowledge of our pasts is the final product of her legacy. Colvin’s writings inspires journalists everywhere with her bravery, unflinching attitude towards sharing people’s stories and most of all, with uncovering the realities of war and grotesque nature of violence and chaos. As compelling as Colvin’s story is, as well as her attitude towards her profession, it comes as no surprise that her need to be in war-torn countries was not only an addiction, but obligation for her. Her desire, respect and duty to her craft is an inspiration to not only journalists everywhere, but people also. To believe in something so deeply, is to be so alive. No one in their right mind has done or will ever do what Marie Colvin has done for journalism, let alone for war coverage also. It comes to me that, even when I write this review, while I sit at the bar at my local Starbucks coffee shop, to ponder the significance, weight and importance of my craft, my art, and my words and how/what they may actually mean to others. Colvin cared for the people she interviewed, she saw the worst but made the best of all her brutalities, but at what cost? At the cost of her life? Her life’s work? The term ‘normal life’ can have many meanings to many different people, and although getting married, having children and having a steady job may define the outline of what is normal against what isn’t, the one constant that A Private War showcased to me as a ‘normal’ viewer was that, no matter what you do, as long as you do it with conviction, passion and heart, even if it is writing a review for such an affecting film, about an equally afflicted life, doing what you love is far more important than doing nothing at all. Night Film Reviews: 8.5 Stars out of 10 Stars. What did you think of A Private War? What did you think as Pike as Colvin? Amazing transformation or laughable turn? What did you think of the supporting cast? Dornan? Tucci? Compelling drama or Oscar bait? Leave your comments below. This entry was posted in Reviews and tagged A Private War, Arash Amel, Film Review, Film Reviews, Jamie Dornan, Marie Brenner, Marie Colvin, Matthew Heineman, Movie Review, Movie Reviews, Night Film, Night Film Reviews, Nikki Amuka-Bird, Rosamund Pike, Stanley Tucci, Tom Hollander. Bookmark the permalink.